A passing NJ Transit train scraped against the derailed Acela, officials said. 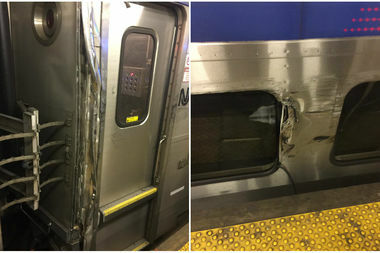 MIDTOWN — Two people suffered minor injuries when a D.C.-bound Amtrak train derailed as it left Penn Station and scraped an incoming NJ Transit car Friday morning, officials said. The Acela Express Train 2151, which originated in Boston, was slowly leaving the transit hub about 9 a.m. when it lurched off the tracks, according to Amtrak officials. Jordan Geary, 34, who is the director of creative development for "Sesame Street," was on the phone beside his sleeping wife as their incoming NJ Transit train was hit, he said. "There was a loud explosion next to my head and everyone in my car screamed out. There was the sound and reverberations of metal scraping my train," Geary said. The glass and metal bent into the train within an inch of Geary's head, he said. "A lot of people were holding their heads because the windows knocked into them. My ears were ringing," Geary said. "When it happened, you have a tenth of a second where you're like, 'A bomb hit us!' After that, you feel and hear that sound and it's, 'No wait, a train sideswiped us.' It's almost weirder and crazier," he added. The crash rattled the passengers in the derailed Acela, they said. "We were leaving the station. It was literally 15 to 20 seconds later. We were off the tracks. It sounded like we were running over something. You could hear the noise. You could feel it," said Tom Steindler, 62, who was heading to Washington, D.C.
“We had just left the station and then there was some banging — a thud — and we stopped. It hadn’t really gotten any distance. The back of the train was still in the station," according Christopher Greenwell, 44, an Englishman who was heading to Philadelphia for a meeting. Back on the NJ Transit train, passengers calmly exited but were told little about what happened, they said. "They didn't make a single announcement except, 'No photos,'" Geary said. Photos on social media show a large dent in the NJTransit car and paint scraped along its side. Two people suffered minor injuries but refused medical attention at the scene, officials said. The 248 passengers and crew on the derailed Amtrak were able to walk to the back of the train and get off safely, officials said. "Everyone was calm. There was some good New York humor," Steindler said. "No problems, but some people had spilled coffee," Greenwell added. NJ Transit suspended its service in and out of Penn Station after the incident, diverting Midtown-bound trains to Hoboken, but cross-honoring fairs. Amtrak service in and out of Penn Station was delayed as their officials investigated the derailment, they said. Keystone service will run in and out of Newark where passengers can then transfer to Northeast Regional trains, which will go into New York, Amtrak officials said. PATH trains will honor Keystone ticketed passengers, officials said. Empire service will transfer to Metro North which will go in and out of Grand Central Terminal, officials said. The MTA also anticipated delays and cancelations along the LIRR into and out of Penn Station, officials said. Commuters who were on the passing NJ Transit train expressed relief and shock on social media after the incident. My train hit another. I was behind that window. Luckily, nobody hurt.